Penguins are kind of flightless bird which are famous of its ability to swim. The fish eaters usually inhabit the vast and unknown Antarctica or any colder southern part of the earth in a large group, except Galapagos penguins that live a little bit north of the equator. This kind of flightless birds spend their lives in two habitats, half of their lives are on the land, and the rest are spent underwater. They are trained hunters in the water, famously known as their ability to swim so fast in the water, while on the land they wiggle cutely. 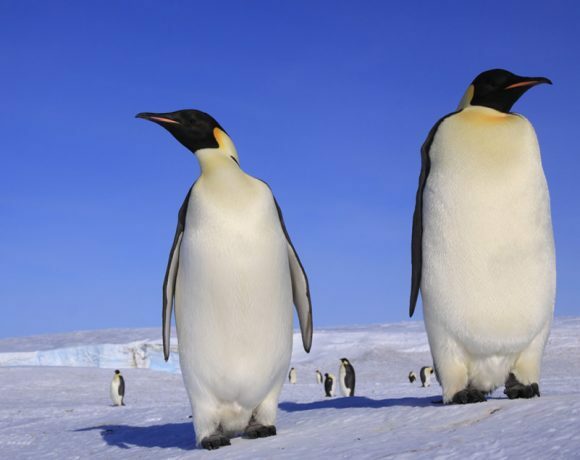 The biggest kind of penguin living on earth nowadays, are emperor penguins. They can grow up to 1.1 meter in height and weight up to 35 kilograms. 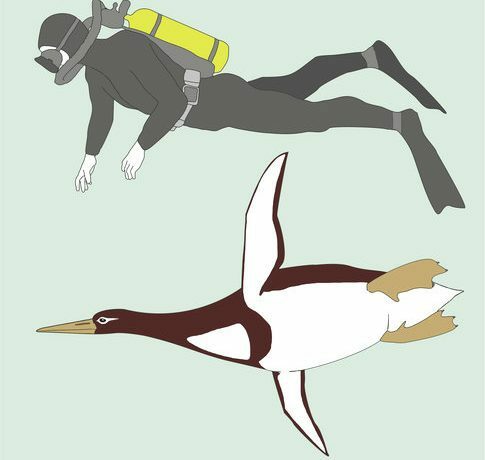 Recently, a group of fossil diggers found a fossil of extinct giant penguin in New Zealand. The size of the penguin was supposedly to be almost 1.8 meters tall and weighed more than one quintal. That’s a size of average 8 years old kids! This species of penguin was named Kumimanu bicae. “It was as tall as a medium-sized man,” said Gerald Mayr, paleontologist at Senckenberg Research Institute who’s also the author of the discovery report. 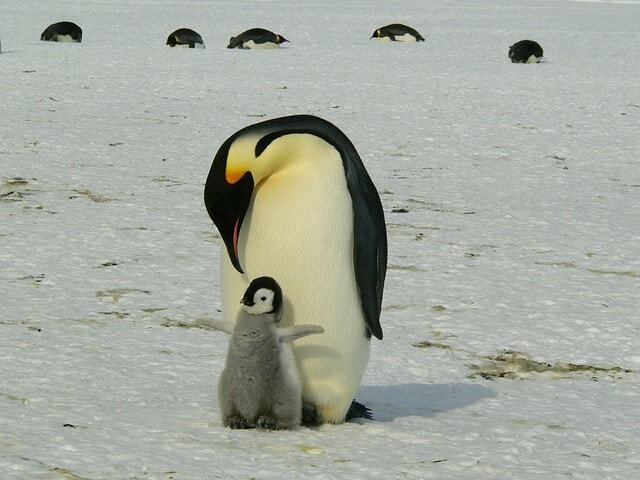 This kind of penguin would have made emperor penguins look like their chicks. The finding actually brought a shock to the scientists, because the fossil was first thought to belong to a giant turtle. But after some researches were conducted, they found out that it was actually the fossil of a penguin in the size of adult human. The naming of Kumimanu bicae was based on local folklore of where the fossil was found, New Zealand. “Kumi” is the name of local giant mythical monster, and “manu” means bird. Thus, Kumimanu was supposedly to represent a giant monstrous bird. It was the biggest kind of penguin ever scientifically and officially discovered by scientists. But they are maybe not the biggest kind of penguins ever inhabit this earth. For your information, in 2014 there was a discovery of supposedly to be 2 meters tall penguin fossil, but the estimation was based only on 2 small bone fragments, making the estimation unclear. The finding of Kumimany bicae set a light for the scientists, not only because it was the biggest penguin ever wiggle on earth, but also because it was the most ancient kind of penguin to ever be discovered. The penguin was predicted to live on earth 56 to 60 million years ago. As a note, the mass extinction of dinosaurs happened 66 million years ago, making the discovery a big hop for the scientists to examine how evolution worked after the mass extinction. In a range of “only” 6 million years, earlier animals had developed so much features, making penguins existence possible. It means that the evolution of penguin was kind of rapid, from ordinary seabirds, into ordinary flightless seabirds, into what people nowadays recognize as “advanced” seabirds which are well adapted to swim. Not only that, the size also showed that there was no dangerous threat to flightless seabirds those days. Before the mass extinction happened, it was not possible for seabirds to be flightless. It was because there were so many large marine predators that could prey on them easily, or simply compete with them for food. But after the predators had gone extinct, such evolution was made possible. Before the finding of the giant penguin fossil, actually scientists have estimated the evolution of penguins. Like stated before, they were predicted to originate from ordinary seabirds which are capable of flying. However, the mass extinction had made the evolution of flightless birds possible. Indeed, some scientists consider that the ability to fly would have made the lives of the penguins easier, like running from predators or in migration. But evolution would never fail the life of any organism, although losing the ability to fly, they got the most efficient pair of flippers to swim. “Clearly, form constrains function in wild animals, and movement in one medium creates tradeoffs with movement in a second medium. Bottom line is that good flippers don’t fly very well,” said Kyle Elliott, a researcher from the University of Manitoba. After losing the ability to fly, penguins became the most efficient aquatic predators at its age, and none of any predators in the early penguin development era could outfight the penguins. That’s why, researchers estimated that some penguins could grow as big as Kumimanu bicae. However, the features of Kumimanu bicae might not look too similar to nowadays penguin. They had longer beaks which were most likely used to spear fish. While nowadays penguins use their swimming speed in the water to catch fish. Starting from ordinary seabirds (which means that they had the capability to fly), penguins evolved into flightless birds in the same size. In fact, penguins are distantly related to puffins, which maintain their capability of flying. After affecting exchanging the ability to fly with two pair of flippers, evolution then affected the size of the penguins. “Birds often evolve toward larger sizes after they lose the ability to fly,” said Mayr. The lack, even absence, of big aquatic predators made them to grow big as the Kumimany bicae. This also happens to large flightless birds like emus, cassowaries, and ostriches. However, as time went by, new species emerged and the size of those penguins went smaller. 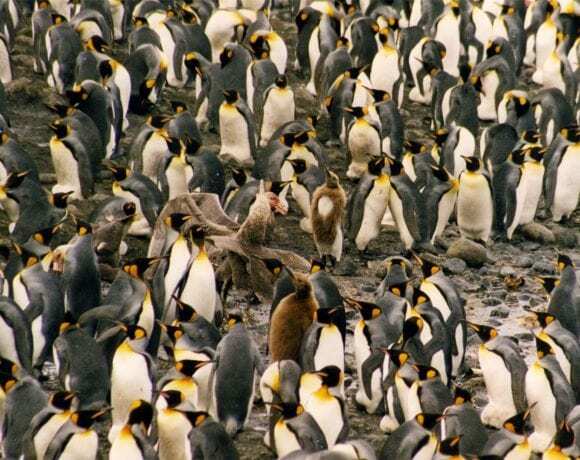 After the large marine mammals such as seals and whales showed up, the penguins should compete for food. If they didn’t, they wouldn’t be able to fulfill the need of nutrition. Scientists predicted that the emerge of large marine mammals were the reason why Kumimanu bicae went extinct. To avoid further extinction in other penguin species, evolution shrank the size of those penguins, making them need less nutrition and able to only live on smaller size food. Since then, we know that the largest penguins nowadays are emperor penguins. The discovery of Kumimanu bicae gave a huge impact to current studies conducted by researchers who study penguins. 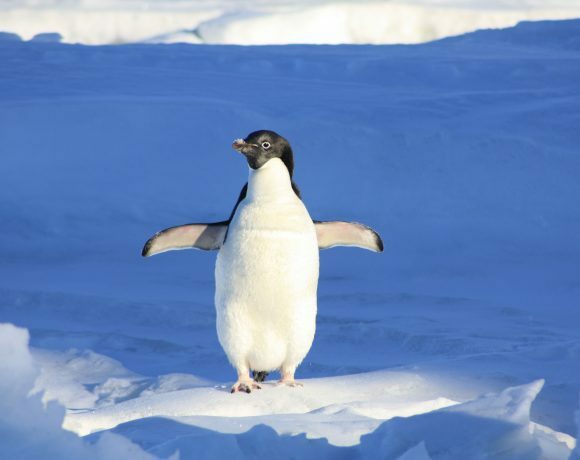 Even now, they start to predict how future penguins will evolve to overcome future changes.